Editor’s Note: It is unusual for RidingGravel.com to have an article written for us with such depth of research and technical acumen as we have presented for you here. It is even annotated! But as our guest contributor, John Ingham said, “Your pieces probably don’t usually have endnotes, but I think they are very important in this case, both so readers can follow up if they want to, and also so readers can be confident that I am not making stuff up.” You can learn more about John by checking the bio which follows after his article and the annotations. Going the distance- both in miles and years- is something many of us strive for. It’s disconcerting, then, when the cardiologist James O’Keefe and his colleagues contend that strenuous exercise causes heart scarring, enlarged hearts, large arterial plaques, and atrial fibrillation. (5) While they admit that exercise has health benefits, they say that the relation between exercise and benefits is curvilinear; that is, moderate exercise is beneficial but extreme endurance exercise is no better than not exercising. A curvilinear relation between exercise and health benefits is sketchy at best. (6) For individuals who do not have preexisting heart conditions there is scant evidence that rigorous exercise is less beneficial than modest exercise. The National Runners’ Health Study showed that cardiovascular biomarkers improve at every point with additional exercise. (7) One recent study in the US found that individuals who exercised three to five times more than recommended by federal guidelines had the lowest mortality, with no increased mortality among those who exercised at ten times the guidelines. (8) And a study of 204,000 Australians between ages 45 and 75 further demonstrated the benefits of vigorous exercise. (9) Some athletes show signs of heart stress after endurance events, but such signs can reflect the normal cycle of stress followed by repair and strengthening. (10) A recent study examined thirty-three “elite male master endurance athletes” ranging in age from 30 to 60. Using state of the art testing and imaging, researchers found enlarged hearts but no acquired heart impairment or pathology. (11) Some studies have found that vigorous exercise increases the lifetime risk of atrial fibrillation by as much as five-fold. While this sounds scary—Afib increases risk for stroke—it is less worrisome than it appears. Since the lifetime risk is roughly 0.5 percent, a five-fold relative increase equals a lifetime absolute risk of only about 2.5 percent. Several large-sample studies of exercisers reach even less alarming conclusions. One of these studies found a slight but statistically insignificant increased risk for Afib in the entire sample, a small increased absolute risk among younger runners, and no increased risk among cyclists. (12) In response to the mounting evidence that more exercise is better than less for most people, O’Keefe and his colleagues have upped their recommended exercise per week from two to five hours. Nonetheless, they still maintain that endurance sports can be harmful. (13) O’Keefe draws on anthropology to support this recommendation. He claims that the hunter-gatherer adaptation required only modest physical effort and thus contends that adaptation to extreme exercise is not part of our evolved biology. (14) Separately from the exercise discussion, he observes that sugar and high-energy carbohydrates promote cardiovascular disease and suggests that we should be eating more like hunter-gatherers. (15) The idea that evolution has shaped our physical capacities and dietary needs is credible enough, but there are two problems. Characterizing ancient hunter-gatherers as moderate exercisers is questionable. And so far as I can tell, O’Keefe has not considered the implications of sugar and high-energy carbohydrates for adverse cardiovascular risks of rigorous exercise, curiously because he is very clear about how and why they are so damaging. High glycemic foods are not good for us, but as we shall see, they may be even worse when combined with high intensity exercise. 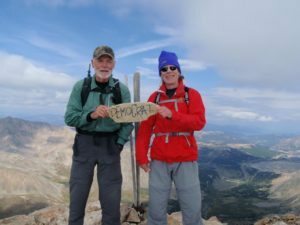 At the summit of Mt. 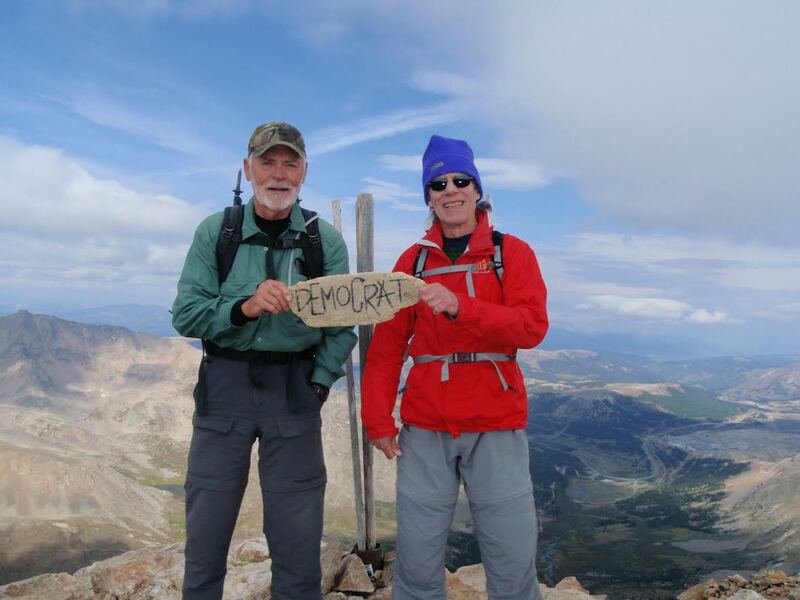 Democrat, a Colorado 14K+ with my old climbing partner Bob Wendell, who is on the left here. At the start of Le Grand du Nord last year. John is on the right here. Along with eliminating sugar, LCHF improves insulin sensitivity and other biomarkers associated with metabolic syndrome, and it typically results in rapid, sustainable loss of belly fat. It thus lowers risk not only for cardiovascular disease but also risks for type 2 diabetes, some cancers, and even Alzheimer’s. (24) It may also help preserve muscle mass and strength into old age. Like older human beings, aging mice are prone to muscle loss or sarcopenia but for what it is worth, mice on a low carbohydrate, ketogenic diet preserved lean muscle mass, strength, and coordination into old age and lived 13 percent longer. (25) Like LCHF, muscle mass increases insulin sensitivity and thus improves biomarkers associated with metabolic syndrome. Finally, it is noteworthy that modest protein and lots of vegetables characterize both Marchand’s diet and what Volek and Phinney call “well formulated” LCHF. Vegetable consumption alone extends life and inhibits various diseases, while broccoli and especially broccoli sprouts in these respects are downright mind-boggling. (26) There are two books I would recommend for readers who find this stuff interesting or helpful. 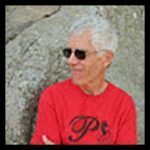 In his “Bike for Life”, Roy Wallack urges eliminating sugar and refined carbohydrates, and gives aging riders advice on training and avoiding injury. In their “Primal Endurance”, Sisson and Kearns present what they view as a healthier approach to endurance training and competition. Along with making a science-based case for LCHF, they urge us to train our bodies to burn fat rather than sugar by moderating pulse rates during aerobic training; by the same token, they want us to avoid “chronic cardio” workouts that result in over training or worse. For stamina and resilience, they recommend intensive intervals once every seven to ten days. They would also have us build and preserve muscle mass with squats, pushups, pull-ups, and planks. For serious, age-defying muscle building, they favor multiple mini-sets to failure with heavy weights (for cyclists, especially dead lifts, squats, and one-legged presses). And they emphasize getting enough sleep and allowing ample time for recovery. Gravel racers might worry that a low carbohydrate diet and less high intensity cardio will result in slower times, but Sisson and Kearns find that their regimen leads to faster times, much faster times in some cases. It will probably not have most of us living to 105 or setting world records with one foot in the grave, but it might very well increase vitality in later years. And that should be good enough when long hard rides in the countryside seem like life itself. Gartachea, Nuria et al. Elite Athletes Live Longer than the General Population: A Meta-Analysis. Mayo Clinic Proceedings 2014(89):1195-1200. In a study of the veterans of a ninety kilometer cross-country ski race, Finnish researchers found atrial fibrillation in only 1.29% of the racers, although they did observe more Afib among skiers who completed more races or had better finishing times (https://www.ncbi.nlm.nih.gov/pubmed/23756332). A Swedish study of 44,410 men who were Afib free at the start of the study found that men who were strenuous exercisers at age thirty had a relative risk increase of just 19% twelve years later compared with men who exercised less than one hour a week and no increased risk was observed in older men, evidently because the benefits of exercise outweighed the risks (http://heart.bmj.com/content/early/2014/03/25/heartjnl-2013-305304). A prospective study of 22,071 US physicians observed a small but insignificant association between exercise and increased risk of Afib in the total sample. 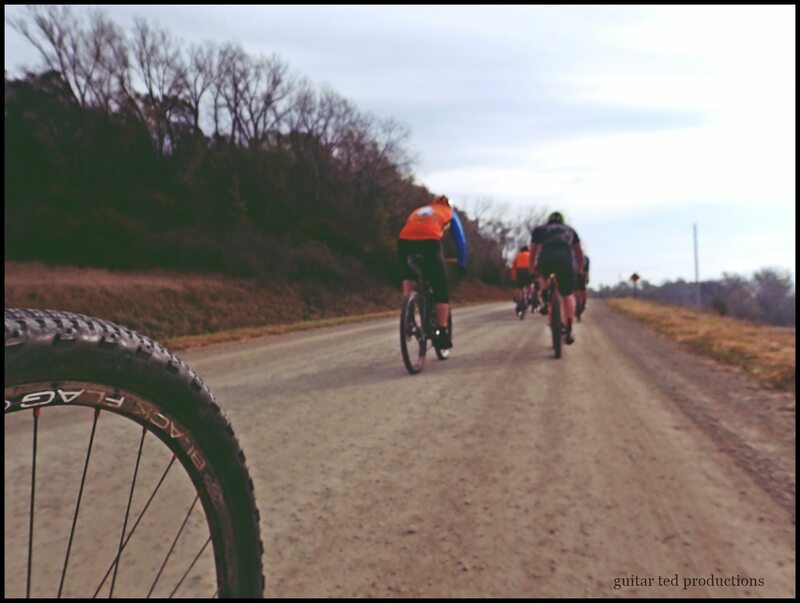 There was a 74% increase in relative risk among younger physicians who jogged 5 to 7 days per week but no increased risk among the young cyclists (https://www.ncbi.nlm.nih.gov/pubmed/19463518). Schnohr, Peter, et al. Reply: Exercise and Mortality Reduction. Journal of the American College of Cardiology 2015: 65(24): 2674-2676. James H. O’Keefe, et al. Exercise Like a Hunter-Gatherer: A Prescription for Organic Fitness. Progress in Cardiovascular Diseases 2011(53):471-479. James H. O’Keefe and Joan O’Keefe. The Forever Young Diet & Lifestyle (Andrew McMeel Publishing, 2005); James H. O’Keefe, et al. Dietary Strategies for Improving Post-Prandial Glucose, Lipids, Inflammation, and Cardiovascular Health. Journal of the American College of Cardiology 2008(51):249-255.
https://www.nytimes.com/2017/02/08/well/move/lessons-on-aging-well-from-a-105-year-old-cyclist.html? Recently Marchand gave up meat out of concern for animals, although his physiologist believes this diet change is hurting his performance. David R. Carrier, et al. The Energetic Paradox of Human Running and Hominid Evolution. Current Anthropology 1984(25):483-495; https://dash.harvard.edu/bitstream/handle/1/3716644/Lieberman_Marathon.pdf?sequence=3 Dennis M Bramble & Daniel E. Lieberman. Endurance Running and the Evolution of Homo. Nature 2004 (432):345-352. Tomas G. Neilan, et al. Myocardial Injury and Ventricular Dysfunction Related to Training Levels Among Nonelite Participants in the Boston Marathon. Circulation 2006 (114):2325-33. See Gary Taubes, The Case Against Sugar (Portobello Books, 2016). In a subset of LCHF dieters, LDL cholesterol and LDL particle count (LDL-p) go up, sometimes way up, even though the number of “good” large LDL particles tends to increase relative to the smaller, “bad” particles and even though HDL tends to go up (good) and triglycerides tend to go down (also good). Some experts say that high LDL-p is not that concerning when part of this pattern; others say high LDL-p is life threatening no matter what. The jury is evidently still out on this issue, but smart money favors lowering LDL. One could take a statin, but it might be just as effective to cut back on saturated fat and increase monounsaturated fats (e.g. olive oil, avocado, and nuts). If LDL cholesterol goes up after shifting to LCHF, one might want to get an NMR Lipoprofile test in order to have a precise picture of what is happening with LDL. Life Extension and other labs offer the test for about $100. See Dr. Rhonda Patrick’s video on sulforaphane. https://www.foundmyfitness.com Scroll through the videos to the fourth one: “Sulforaphane and Its Effects on Cancer, Mortality, Aging. 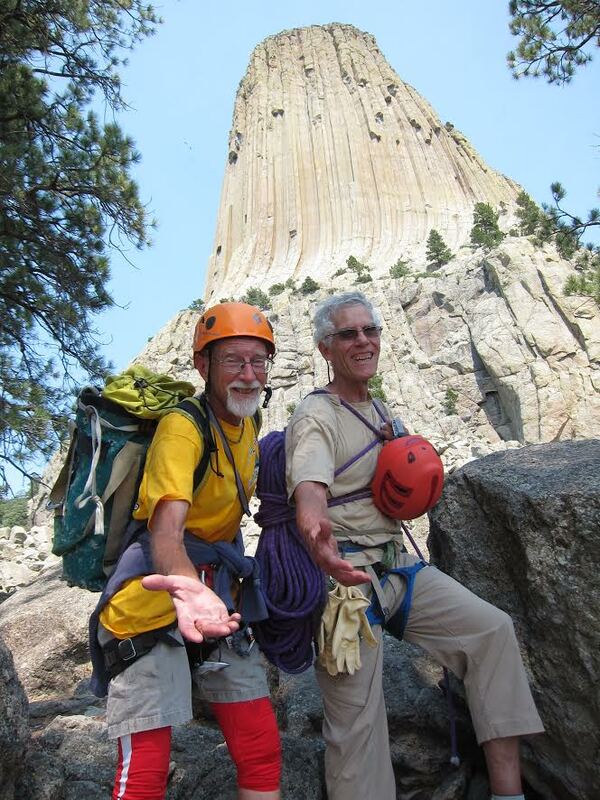 John Ingham is Professor Emeritus of Anthropology at the University of Minnesota. He rode a hybrid bike on trails for years. 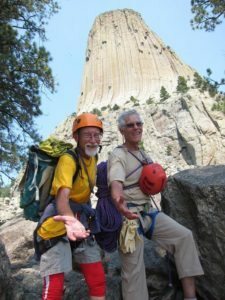 When he retired in 2011, he renewed his earlier passions for rock climbing, mountaineering, and back packing and began doing longer rides. 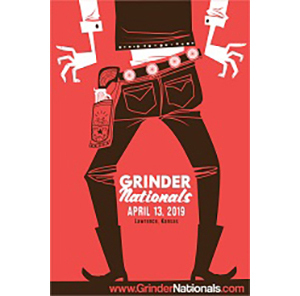 He has been gravel racing for two years and has completed various races, including the Heck of the North, the Almanzo 100, and the Dirty Lemming 100. 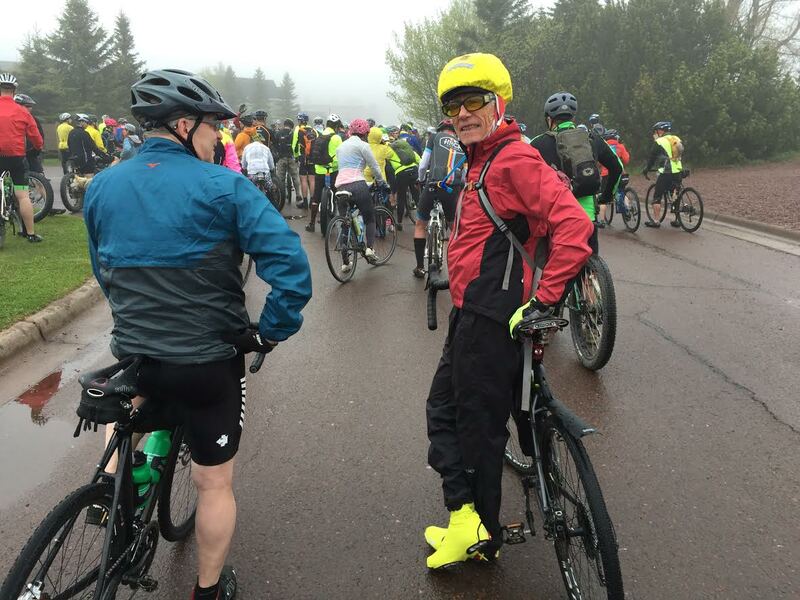 Now 76, he appears to be the oldest rider in Minnesota completing major gravel races. Nice job. I personally adopted a low-carb, high-fat regime about 9 months ago as a recreational cyclist. I’ve had nothing but excellent results with my body composition as well as endurance. Now dabbling with non-endurance competition, it seems like I may benefit from dipping into conventional carb sources for those rides with especially intense efforts or prolonged periods spent near or above anaerobic threshold. But certainly not giving up LCHF for the other 90% of my life. Thanks for the article and I am going to check out Bike For Life. Sugar is so hard to quit but I am making progress. Why is it when I try to talk to fellow cyclists about this stuff they look at me like I have snakes crawling out of my ears. Then they go back to guzzling Gatorade and chewing Power Bars.